For the 2015 film, see Katherine of Alexandria (film). 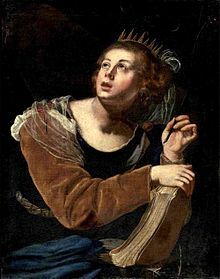 Saint Catherine of Alexandria, or Saint Katharine of Alexandria, also known as Saint Catherine of the Wheel and The Great Martyr Saint Catherine (Coptic: Ⲙⲁⲅⲓⲁ Ⲕⲁⲧⲧⲣⲓⲛ; Greek: ἡ Ἁγία Αἰκατερίνη ἡ Μεγαλομάρτυς "Holy Catherine the Great Martyr"; Latin: Catharina Alexandrina), is, according to tradition, a Christian saint and virgin, who was martyred in the early 4th century at the hands of the pagan emperor Maxentius. According to her hagiography, she was both a princess and a noted scholar, who became a Christian around the age of 14, converted hundreds of people to Christianity, and was martyred around the age of 18. More than 1,100 years following her martyrdom, Saint Joan of Arc identified Catherine as one of the Saints who appeared to her and counselled her. Some modern scholars consider that the legend of Catherine was probably based on the life and murder of the Greek philosopher Hypatia, with reversed roles of Christians and pagans. According to the traditional narrative, Catherine was the daughter of Constus, the governor of Egyptian Alexandria during the reign of the emperor Maximian (286–305). From a young age she devoted herself to study. A vision of the Madonna and Child persuaded her to become a Christian. When the persecutions began under Maxentius, she went to the emperor and rebuked him for his cruelty. The emperor summoned 50 of the best pagan philosophers and orators to dispute with her, hoping that they would refute her pro-Christian arguments, but Catherine won the debate. Several of her adversaries, conquered by her eloquence, declared themselves Christians and were at once put to death. Angels transported her body to the highest mountain (now called Mt. Saint Catherine) next to Mount Sinai, where God gave His Law. In 850, her incorrupt body was discovered by monks from the Sinai Monastery. The monks found on the surface of the granite on which her body lay, an impression of the form of her body. Her hair still growing, and a constant stream of the most heavenly fragranced healing oil issuing from her body. This oil produced countless miracles. Donald Attwater dismisses what he calls the "legend" of Saint Catherine, arguing for a lack of any "positive evidence that she ever existed outside the mind of some Greek writer who first composed what he intended to be simply an edifying romance." Harold Davis writes that "assiduous research has failed to identify Catherine with any historical personage" and has theorized that Catherine was an invention inspired to provide a counterpart to the story of the slightly later pagan philosopher Hypatia of Alexandria (c. 350–370 – March 415 CE). Modern scholarship supports Davis’ assumption that the legend of Catherine of Alexandria was probably based on the life and murder of Hypatia, with the roles of Christians and pagans reversed. Hypatia was a Greek mathematician, astronomer, and philosopher, who was brutally murdered by a Christian mob after being accused of exacerbating a conflict between two prominent figures in Alexandria, the governor, Orestes, and the bishop, Cyril of Alexandria. 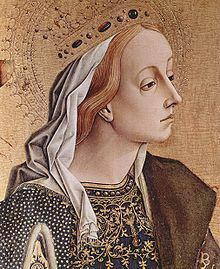 Sometimes cited as a possible inspiration of Saint Catherine, the writer Eusebius wrote, around the year 320, that the Emperor had ordered a young Christian woman to come to his palace to become his mistress, and when she refused, he had her punished, by having her banished and her estates confiscated. Although Eusebius did not name the woman, she had been identified with Dorothea of Alexandria. 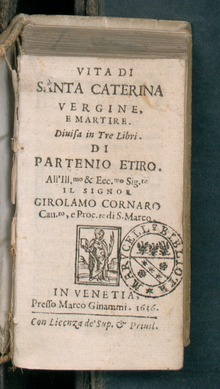 The earliest surviving account of Saint Catherine's life comes around 600 years after the traditional date of her martyrdom, in the menologium a document compiled for Emperor Basil II (976), although the rediscovery of her relics at Saint Catherine's Monastery at the foot of Mount Sinai was about 800, and presumably implies an existing cult at that date (the common name of the monastery developed after the discovery). The monastery was built by order of Emperor Justinian I (reigned 527–565), enclosing the Chapel of the Burning Bush ordered to be built by Helena, the mother of Constantine I, at the site where Moses is supposed to have seen the burning bush; the living bush on the grounds is purportedly the original. It is also referred to as "Saint Helen's Chapel". The main church was built between 548 and 565, and the monastery became a major pilgrimage site for devotees of Catherine and the other relics and sacred sites there. Saint Catherine's Monastery survives, and is a famous repository of early Christian art, architecture and illuminated manuscripts that remains open to tourists and visiting scholars. The site is sacred to Christianity, Islam, and Judaism. "As we have seen, the cult of St Katherine of Alexandria probably originated in oral traditions from the 4th-century Diocletianic Persecutions of Christians in Alexandria. There is no evidence that Katherine herself was a historical figure and she may well have been a composite drawn from memories of women persecuted for their faith. Many aspects of her Passio are clearly legendary and conform to well-known hagiographical topoi." Rufinus states that her first name was Dorothea (Greek: Δωροθέα), and that at her christening she acquired the name Aikaterina (Αικατερίνα), a name that signifies her pure, clean and uncontaminated nature (from Greek αιέν καθαρινά 'ever clean'). Saint Catherine was one of the most important saints in the religious culture of the late Middle Ages, and arguably considered the most important of the virgin martyrs, a group including Saint Agnes, Margaret of Antioch, Saint Barbara, Saint Lucy, Valerie of Limoges and many others. Her power as an intercessor was renowned and firmly established in most versions of her hagiography, in which she specifically entreats Christ at the moment of her death to answer the prayers of those who remember her martyrdom and invoke her name. The development of her medieval cult was spurred by the reported rediscovery of her body around the year 800 at Mount Sinai, with hair still growing and a constant stream of healing oil issuing from her body. There are several pilgrimage narratives that chronicle the journey to Mount Sinai, most notably those of John Mandeville and Friar Felix Fabri. However, the monastery at Mount Sinai was the best-known site of Catherine pilgrimage, but was also the most difficult to reach. The most prominent Western shrine was the monastery in Rouen that claimed to house Catherine's fingers. It was not alone in the west, however, accompanied by many, scattered shrines and altars dedicated to Catherine, which existed throughout France and England. Some were better known sites, such as Canterbury and Westminster, which claimed a phial of her oil, brought back from Mount Sinai by Edward the Confessor. Other shrines, such as St. Catherine's Hill, Hampshire were the focus of generally local pilgrimage, many of which are only identified by brief mentions in various texts, rather than by physical evidence. St. Catharine's College, Cambridge was founded on St Catharine’s Day (25 November) 1473 by Robert Woodlark (the then-provost of King's College Cambridge) who sought to create a small community of scholars who would study exclusively theology and philosophy. Wodelarke may have chosen the name in homage to Catherine of Valois, mother of Henry VI of England, although it is more likely that it was named as part of the Renaissance cult of Saint Catharine, who was a patron saint of learning. At any rate, the college was ready for habitation and formally founded on Saint Catharine’s Day, 1473. Saint Catherine also had a large female following, whose devotion was less likely to be expressed through pilgrimage. The importance of the virgin martyrs as the focus of devotion and models for proper feminine behavior increased during the Late Middle Ages. Among these, St. Catherine in particular was used as an exemplar for women, a status which at times superseded her intercessory role. Both Christine de Pizan and Geoffrey de la Tour Landry point to Catherine as a paragon for young women, emphasizing her model of virginity and "wifely chastity." From the early 14th century the Mystic marriage of Saint Catherine first appears in hagiographical literature and, soon after, in art. In the Western church, the popularity of her cult began to reduce in the 18th century. Her principal symbol is the spiked wheel, which has become known as the Catherine wheel, and her feast day is celebrated on 25 November by most Christian churches. However, the Russian Orthodox Church celebrates it on 24 November (as do also the Polish, Serbian and Bulgarian Orthodox Churches). The exact origin of this tradition is not known. In 11th-century Kyivan-Rus, the feast day was celebrated on 25 November. Saint Dimitry of Rostov in his Kniga zhyttia sviatykh (Book of the Lives of the Saints), T.1 (1689) places the date of celebration on 24 November. A story that Empress Catherine the Great did not wish to share her patronal feast with the Leavetaking of the feast of the Presentation of the Theotokos and hence changed the date is not supported by historical evidence. One of the first Roman Catholic churches to be built in Russia, the Catholic Church of St. Catherine, was named after Catherine of Alexandria because she was Catherine the Great's patron. A footnote to the entry for 25 November in The Synaxarion compiled by Hieromonk Makarios of Simonos Petra states: "Until the 16th century, the memory of St Catherine was observed on 24 Nov. According to a note by Bartholomew of Koutloumousiou inserted in the Menaion, the Fathers of Sinai transferred the date to 25 Nov. in order that the feast might be kept with greater solemnity." Ranked with St Margaret and St Barbara as one of the fourteen most helpful saints in heaven, she was unceasingly praised by preachers and sung by poets. It is believed that Jacques-Benigne Bossuet dedicated to her one of his most beautiful panegyrics and that Adam of St. Victor wrote a magnificent poem in her honour: Vox Sonora nostri chori. In France, unwed women who have attained the age of 25 wear richly decorated bonnets on the day of her feast. This custom gave rise to the French idiom coiffer Sainte-Catherine ('don St. Catherine's bonnet'), to describe an unmarried woman between the ages of 25 and 30. In memory of her sacrifice in some homes, Egyptian and other Middle Eastern foods are offered for her feast, such as hummus or tabbouleh salads. Favorites also are melons cut into circles with sherbet "hubs," or cookies shaped as spiked wheels with icing. Meanwhile, owing to several circumstances in his life, Saint Nicholas of Myra was considered the patron of young bachelors and students, and Saint Catherine became the patroness of young maidens and female students. Looked upon as the holiest and most illustrious of the virgins of Christ after the Blessed Virgin Mary, it was natural that she, of all others, should be worthy to watch over the virgins of the cloister and the young women of the world. The spiked wheel having become emblematic of the saint, wheelwrights and mechanics placed themselves under her patronage. Finally, as according to tradition, she not only remained a virgin by governing her passions and conquered her executioners by wearying their patience, but triumphed in science by closing the mouths of sophists, her intercession was implored by theologians, apologists, pulpit orators, and philosophers. Before studying, writing, or preaching, they besought her to illumine their minds, guide their pens, and impart eloquence to their words. This devotion to Saint Catherine which assumed such vast proportions in Europe after the Crusades, received additional éclat in France in the beginning of the 15th century, when it was rumoured that she had spoken to Joan of Arc and, together with Saint Margaret, had been divinely appointed Joan's adviser. Devotion to Saint Catherine remains strong amongst Eastern Catholics and Eastern Orthodox Christians. With the relative ease of travel in the modern age, pilgrimages to Saint Catherine's Monastery at Mount Sinai have increased. Pilgrims to her monastery on Mt Sinai are given a ring, which has been placed on the relics of the saint as an evlogia (blessing) in remembrance of their visit. The pyrotechnic Catherine wheel, from which sparks fly off in all directions, took its name from the saint's wheel of martyrdom. Countless images of Saint Catherine are depicted in art, especially in the late Middle Ages, which is also the time that the account of Saint Catherine's Mystical Marriage makes its first literary appearance. She can usually be easily recognised as she is richly dressed and crowned, as befits her rank as a princess, and often holds or stands next to a segment of her wheel as an attribute. She also often carries either a martyr's palm or the sword with which she was actually executed. She often has long unbound blonde or reddish hair (unbound as she is unmarried). The vision of Saint Catherine of Alexandria usually shows the Infant Christ, held by the Virgin, placing a ring (one of her attributes) on her finger, following some literary accounts, although in the version in the Golden Legend he appears to be adult, and the marriage takes place among a great crowd of angels and "all the celestial court", and these may also be shown. She is very frequently shown attending on the Virgin and Child, and is usually prominent in scenes of the Master of the Virgo inter Virgines, showing a group of virgin saints surrounding the Virgin and Child. Notable later paintings of Catherine include single figures by Raphael (National Gallery) and Caravaggio (Madrid), (Thyssen-Bornemisza Museum). The opening scene of The Sopranos episode 38, "Amour Fou", features mob wife Carmela Soprano and her daughter Meadow Soprano in an art museum, where (among other topics) they discuss Jusepe de Ribera's painting: The Mystical Marriage of Saint Catherine of Alexandria. A movie about Catherine, called Decline of an Empire, began production in January 2010 and was released in 2014. ^ Self-Ruled Antiochian Orthodox Christian Archdiocese of North America. Accessed 11 December 2014. ^ "Liturgical Year : This Item Currently Unavailable". ^ a b See Christine Walsh: The Cult of St Katherine of Alexandria in Early Medieval Europe, Aldershot 2007, p. 3–26; Michael A. B. Deakin: Hypatia of Alexandria, Mathematician and Martyr, Amherst (New York) 2007, p. 135, 202; Maria Dzielska: Hypatia of Alexandria, Cambridge (Massachusetts) 1995, p. 21; Christian Lacombrade: Hypatia. In: Reallexikon für Antike und Christentum, Bd. 16, Stuttgart 1994, Sp. 956–967, here: 966; Gustave Bardy: Catherine d’Alexandrie. In: Dictionnaire d’histoire et de géographie ecclésiastiques, Bd. 11, Paris 1949, Sp. 1503–1505, here: 1504. ^ "Great Martyr Catherine of Alexandria". ^ a b c "Clugnet, Léon. "St. Catherine of Alexandria." The Catholic Encyclopedia, Vol. 3. New York: Robert Appleton Company, 1908. 1 May 2013". Newadvent.org. 1 November 1908. Retrieved 26 August 2013. ^ "Saint Catherine of Alexandria". Encyclopædia Britannica. Retrieved 29 October 2010. ^ a b "Foley O.F.M., Leonard. ''Saint of the Day, Lives, Lessons, and Feast,(revised by Pat McCloskey O.F.M. ), Franciscan Media". Americancatholic.org. ISBN 978-0-86716-887-7. Retrieved 26 August 2013. ^ Mateus Soares de Azevedo (25 April 2005). Ye shall know the truth: Christianity and the perennial philosophy. World Wisdom, Inc. p. 324. ISBN 978-0-941532-69-3. Retrieved 29 November 2011. ^ A. B. Deakin, Michael (1994). Hypatia and Her Mathematics. Mathematical Association of America. pp. 234–243. ^ a b "Catherine of Alexandria, Lives of Saints". John J. Crawley & Co., Inc. Retrieved 26 August 2013. ^ a b S. R. T. O d'Ardeene and E. J. Dobson, Seinte Katerine: Re-Edited from MS Bodley 34 and other Manuscripts (Oxford: Oxford University Press, 1981), xiv. ^ John Mandeville, The Travels of Sir John Mandeville (New York: Dover Publications Inc., 1964); Felix Fabri, The Wanderings of Felix Fabri (New York: AMS Press, 1971), 217. ^ Lewis, Pilgrimage and the Cult of St. Katherine, 49–51. ^ John Bugge, Virginitas: An Essay in the History of the Medieval Ideal (The Hague: Martinus Nijhoff Publishers, 1975), 132; Katherine J. Lewis, The Cult of St. Katherine of Alexiandria in Late Medieval England (Rochester: The Boydell Press, 2000), 229; Eamon Duffy, The Stripping of the Altars: Traditional Religion in England c. 1400-c. 1580 (New Haven: Yale University Press, 1992), 174. ^ Katherine J. Lewis, "Model Girls? Virgin-Martyrs and the Training of Young Women in Late Medieval England" in Young Medieval Women eds. Katherine J. Lewis, Noel James Menuge and Kim M. Phillips (New York: St. Martin's PRess, 1999). ^ Christine de Pizan, The Treasure of the City of Ladies trans. by Sarah Lawson (New York: Penguin Books, 2003), 146; Christine de Pizan, The Book of the City of Ladies trans. by Rosalind Brown-Grant (New York: Penguin Books, 1999), 203; Rebecca Barnhouse, The Book of the Knight of the Tower (New York: Palgrave Macmillan, 2006), 126, 193. ^ "Coiffer sainte Catherine". La France pittoresque (in French). 24 November 2016. ^ Life of Saint "Katherine" in William Caxton's English version of the Golden Legend. ^ mohill05 (12 August 2014). "Katherine of Alexandria (2014) – IMDb". IMDb. Wikimedia Commons has media related to Catherine of Alexandria.